Since Spark SQL is really a declarative interface, the actual computations take place mostly in JVM. But if we write and use UDFs in Python, the calls have to be made to Python interpreter, which is a separate process. Thus, there is considerable overhead of doing so, as visible on the above figure. The simplest solution to Python UDFs is to use the available functions, which are quite rich. These functions take and return Column, thus, they can be composed to create more complex functions. The above works fine in Scala (and Java), but one may want to use it in Python. Since LanguageDetector is used as a UDF it should be quite easily usable for detecting the language for each string value it receives. The function will result in DataFrame’s null if it can’t detect anything, which is most likely to happen if the sentence is too short or is missing in general. First, we need to build the JAR file as usual, using SBT. I suggest using sbt assembly in this case, as it contains all the required dependencies, with Spark being marked as provided, though, the assembly (fat) JAR is quite small, about 4MB in total. Note that you may need to change the Spark version, as the current default set in SBT files is 2.2.0. We start a Spark session as usual, though we need to include the JAR as a configuration parameter spark.jars. The driver class path extension is optional as it is only required for the local run, when the driver plays the role of executor as well. The sample session configuration is provided below; note that you may need to alter the JAR path and name. If the above goes well without any issue, we can go further and prepare some small sample set to test the UDF on. Having JAR registered, we can approach the problem of porting the function into Python. The business logic will be executed in JVM but we need to create a way to call it from Python, in a form similar to Spark functions. 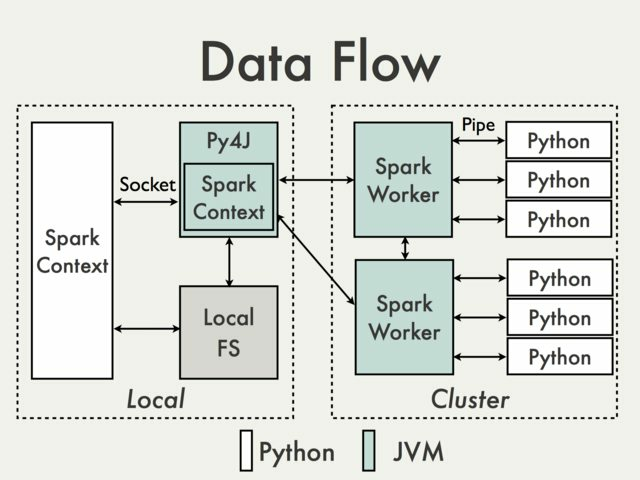 In Spark to communicate between driver’s JVM and Python instance, gateway provided by Py4j is used; this project is a general one, without dependency on Spark, hence, you may use it in your other projects. The JVM gateway is already present in Spark session or context as a property _jvm. For example, we can use the Java’s random number generator as follows. Note that the types are automatically casted to Python. Though, this is not always the case. Let’s call out getUdf method. We get back some Java object, but it doesn’t seem to be too usable. Indeed, we need to create a Python function as below to map the object and types correctly. First we create an instance of Java class jc. We call the method directly as it is defined in Scala’s object and, thus, is a static method, but in case you’d need to create an instance of new object you can use the below substitute. The function _to_seq turns the list of columns into a Java sequence. It requires Spark Context and conversion function, i.e. _to_java_column to transform the objects correctly. The created sequence is then passed to apply function of our UDF. Note, that we need to cast the result of the function to Column object as it is not done automatically. Once the above function register correctly, we can use it with DataFrame, by passing it the name or Column object of interest. Alternativelly, if we require the function to be used in SQL expressions, we can use the provided method registerUdf and, well, register UDF for SQL expression usage. Since the default name is also lang, we can use it as follows. Now UDF lang_detect should also work. Above we’ve shown only one, relatively simple UDF. Nonetheless, this method, with some small alterations, can be used for different functions, UDFs or otherwise, to be registered in Python.